Looking to get away and spend a week with your toes in the sand and listening to the relaxing sounds of the ocean? 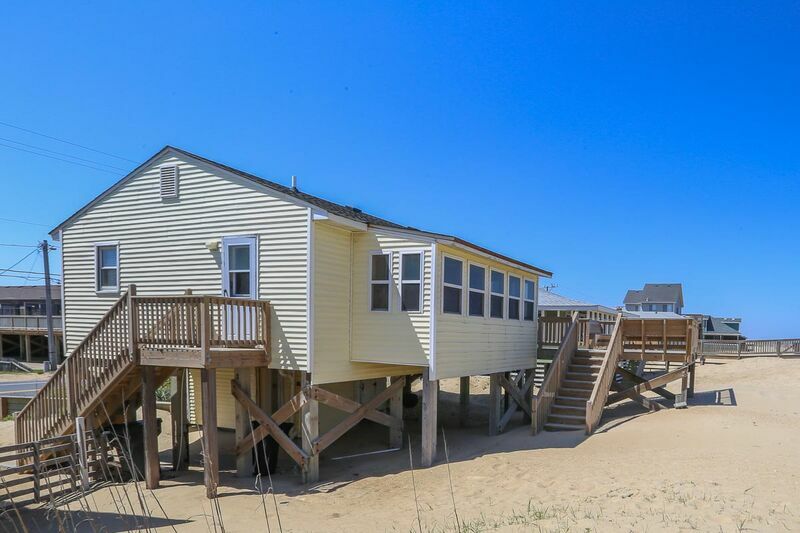 “Cozy Cottage” offers you that exact opportunity in this cozy, classic oceanfront home all on one level of living. The gorgeous views and spectacular sunrises from the large oceanfront deck will be a wonderful start to your day! Pack up the family and come enjoy this home, the salty sea breezes and the beautiful beaches. 3 bedrooms (1 with Queen and 2 with Double); full bathroom; kitchen with washer/dryer; living and dining area. New floors in kitchen and new furniture for 2019. The pictures are true as to what is there, but it is larger and brighter than I thought. We had NO trouble with the AC as reported in another review. Would rent this again if I come to the Outer Banks.